Complete your vehicle's look and ensure safety with a new rear dashboard cover! Our rear dash covers are custom built to pull together the interior look of your vehicle and protect your dash from the elements. Your rear dash will look good as new with the help of our dash cover. Harmful UV sun rays won't stand a chance against our dash covers, which come in a variety of fabrics, colors and fits to suit your needs. No dashboard is safe from the damaging rays of the sun -- unless, of course, you have a set of our matching dash covers! Our rear dash covers protect your dashboard from the elements and prevent damage that can lessen the overall value of your vehicle. 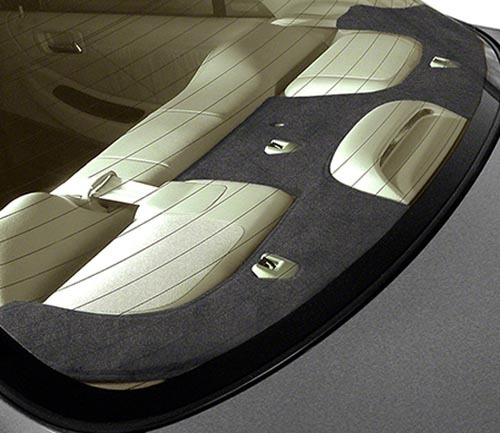 Custom dash covers ensure your vehicle is taken care of and looks great at the same time. Our dash covers come in a variety of styles and moldings to seamlessly fit with your make and model -- whatever it may be. Don't waste time installing! Our dash covers install quickly so you can pop it on and get back on the road. Our unique, durable and long-lasting poly carpet fabric resists fading and sun damage even in intense climates. With our rear dash cover in place, you can also reduce glare from the sun and headlights while on the road. Keep your vehicle safe and in tip-top shape with one of our various custom rear dash covers. Opt for a universal fit or customize it to your liking with colors and your model's molding for a cover that's just your style. No matter which cover you choose, you can guarantee it will last you for years to come and keep your vehicle safe, attractive and in the best shape.